Addiction is a loss of control in the consumption of a substance despite the negative and harmful consequences associated with it. Nicotine is an addictive drug which smokers find difficult to resist. The body becomes dependent on levels of nicotine, therefore smokers are constantly topping up these levels to avoid withdrawal symptoms. Cigarettes and smoking become the smokers best friend. They quickly develop associations with smoking using it as a reward or to make them feel better during times of stress or upset. Smoking becomes habit and smokers will have certain times of the day or certain situations when they choose to smoke for example; first thing on waking, with a cup of coffee, at the end of a meal, during breaks, at social get togethers with friends, when driving the car, when watching TV, speaking on the telephone and following stressful situations or times of anxiety. When smokers quit smoking they experience similar feelings to that of a bereavement. The loss of their cigarettes and pleasure of smoking with other associations of routines, and situations in which they used to smoke can cause feelings of loss, fear, panic, anger and anxiety. Smokers rely on their habit to keep them calm, relaxed and to help them through the good and bad times in their life. This is another reason why smokers find it so hard to quit as they miss the very thing that helps through stress and anxiety. Other associations such as having a lighter and cigarettes in their pocket give a feelings of reassurance and comfort. They become their friend, always there whenever they're needed. For many smokers the thought of being without them is unbearable. Having their cigarettes close by signifies and strengthens that dependence even more. 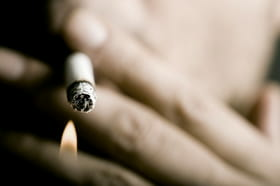 Some smokers have special places where they like to smoke and are unable to resist lighting up a cigarette immediately. Some smokers enjoy smoking when alone and want a quiet moment. They see this time as important to them escaping from life for a brief moment. The majority of smokers are completely aware of the risks they take with smoking. Some gain a certain pleasure knowing they could harm themselves and like the risk element of taking a chance that smoking will not harm them. For others they deliberately continue to smoke as they seek to cause harm to themselves. At the beginning of nicotine addiction the nicotine receptors multiply in certain zones of the brain. The dependence occurs as soon as the amount of nicotine decreases in the blood. As soon as the nicotine levels drop, the nicotine receptors need their stimulant and the smoker needs to have a cigarette. It takes less then 8 seconds for the effect of nicotine to occur and lasts approximately 20 to 45 minutes. This immediate hit of nicotine to the brain is what gives the most amount pleasure in smoking and thus creates the dependence which happens as a result of this. Each cigarette that is smoked increases the dependence making smokers more addicted to tobacco. Withdrawal symptoms quickly occur (irritability, anger, sweating, shaking...) when the body does not obtain sufficient amounts of nicotine and the levels are decreasing. The need to smoke almost becomes critical to a smoker, otherwise the withdrawal symptoms become unbearable. The younger a person smokes, the more likelihood of dependence is. Latest update on February 7, 2011 at 03:04 PM by Janey39. This document, titled "Why such an addiction to tobacco?," is available under the Creative Commons license. Any copy, reuse, or modification of the content should be sufficiently credited to CCM Health (health.ccm.net). Dépendance au tabac - Evaluer sa dépendance ¿Por qué hay tanta dependencia al tabaco? Warum macht Rauchen abhängig?